Creating the perfect environs for modern family living can often be an arduous task, with thematic design sometimes feeling a little limiting when we're forced to choose a style and stick to it. 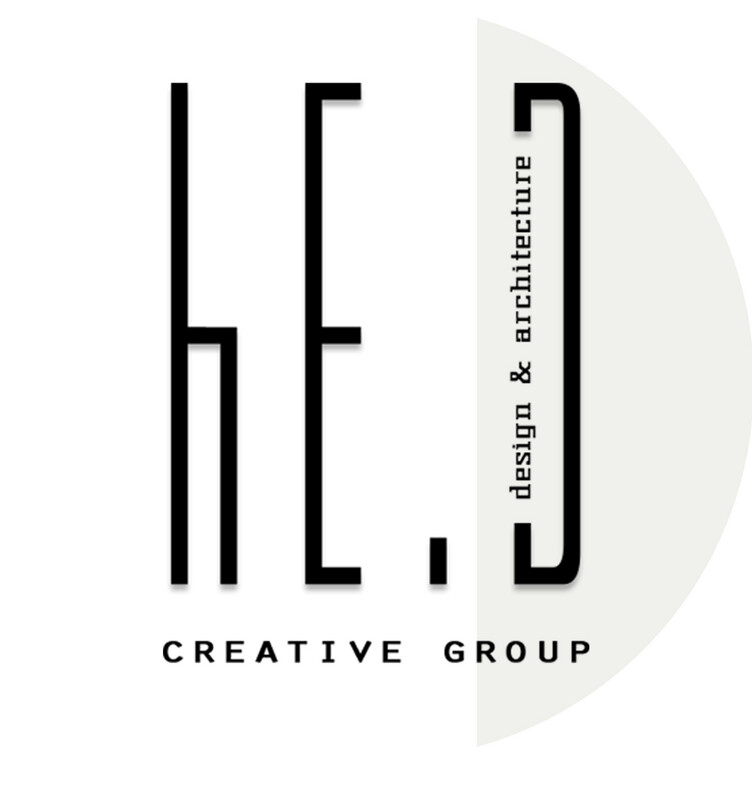 It's for this reason that eclectic blending can often yield positive results, as demonstrated by Ukraine's hE.D Creative Group, who have managed to mix rustic, industrial, country and modern aesthetics to magnificent effect in the home you're about to see. From the outset this house appears wonderfully inviting, with its casual living room incorporating a voluminous lounge suite on which to relax and unwind, surrounded by large windows, a modern television and an enormous, contemporary painting. Behind the living area rests a contemporary kitchen and dining setting, with sleek lines and smooth surfaces characterising each space. The bathroom is dressed in cool grey tones, with the polished concrete of the floors and ceilings beautifully offset by pristine white and silver fixtures, while the home's master bedroom blends elements of rustic, industrial and country living to create an inventive, eclectic atmosphere. All in all this home has been beautifully designed, with its finishes and furnishings appealing to a range of tastes and aesthetics. 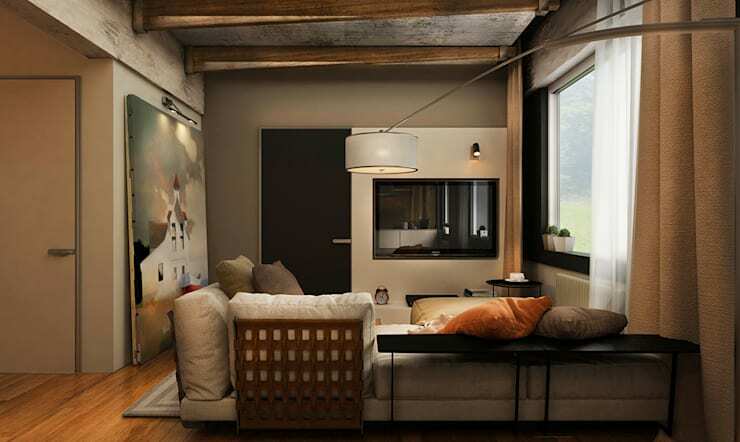 Take a tour below and gain some inspiration on how to spice up your abode with a blend of design elements! This home undoubtedly showcases modern living at its finest, with its beautiful design creating a warm, welcoming and sophisticated atmosphere. 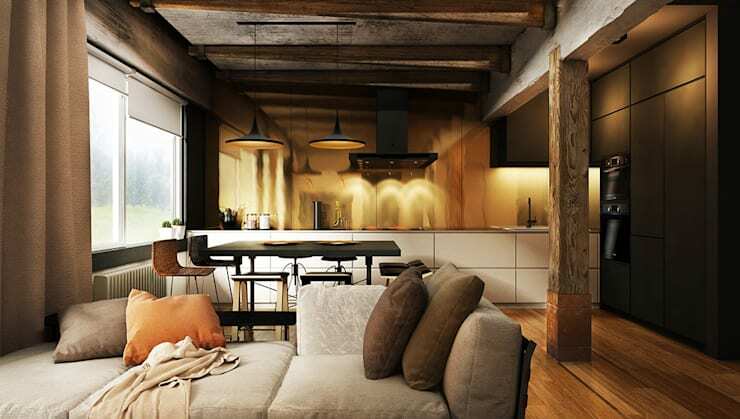 Flowing floorboards ground the space, with the exposed beams and textured concrete of the ceiling adding an industrial element to the decor. The furnishings have been kept comfortable and contemporary, with the voluminous lounge suite seen here contrasting against the simple sophistication of the dining setting, and clean lines of the coffee table and television unit. Best of all is the steady influx of natural light streaming through the windows, illuminating the warm tones of the finishes and furnishings in this relaxed and inviting space. This vantage lends insight into the range of tones and textures that have been included within this design, from the exposed ceiling to the thick textile of the curtains and warm woodgrain of the floors. The living space appears casual and inviting, the perfect area in which to relax in front of a film or admire the view streaming through the large windows. To the left sits an enormous, modern painting, drawing focus from the television and balancing the colours filtering through the windows. The message of the painting, that a home is a castle, is definitely true in this case! The kitchen and dining areas have been designed with contemporary sophistication in mind, with their sleek lines presenting a departure from the casual comfort of the living room. A high, black table surrounded by bar stools waits to accommodate meals and entertaining, while an expansive kitchen, replete with a lengthy bench full of storage options has been included for stylish functionality. The entire space is beautifully lit, not only by natural light flowing through the large windows, but by an array of lamps and spotlighting reflecting off the kitchen's expansive, golden feature wall. 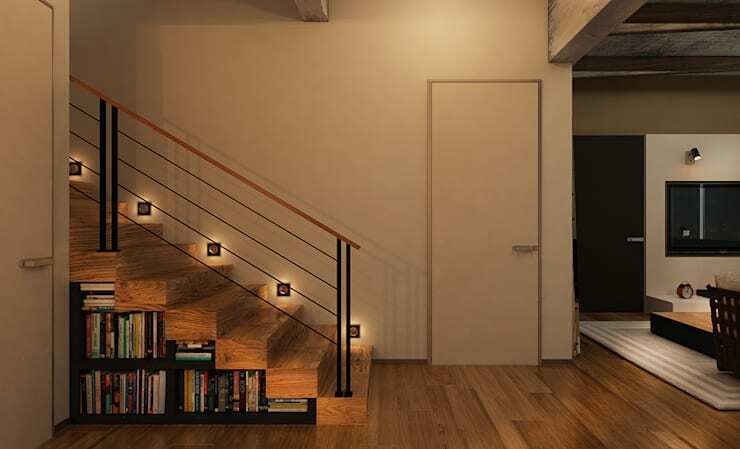 The transitive areas of the home also appear relaxed and inviting, with the soothing tones of woodgrain coupled with simple, white walls combining for a classic effect. The large, wooden blocks constructing the stairwell contribute to its strong, modern aesthetic, while the space beneath has been filled with geometric bookshelves housing a colourful collection of titles. The master bathroom in this house is resplendent in cool grey, with its walls and ceiling constructed of marbled, polished concrete. The entire space exudes a contemporary edge, with the corner bathtub presenting a novel design alongside the cubist floating toilet, which itself matches the shape of the lamps and spot lighting illuminating the room. The sink unit is simple and stylish, and has been bordered by an expansive mirror, with the combination of silver, white and grey throughout the space delighting with contemporary appeal. 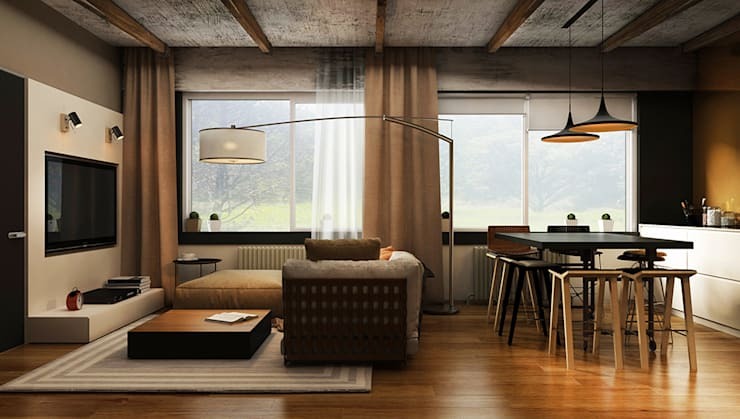 The master bedroom of the home is impressive in its eclectic style, with a blend of rustic, industrial and country aesthetics combining to create a magnificent space. 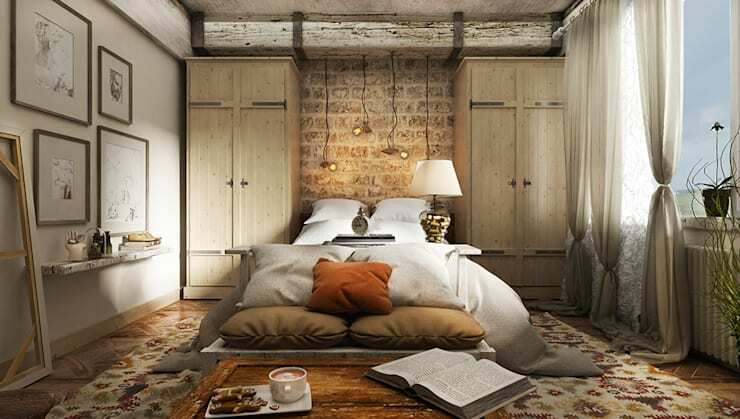 The exposed brick of the far wall, coupled with an age-worn ceiling beam, presents the alluring combination of rustic and industrial styles, while the twin, timber cupboards and thick textiles of the cosy bed are inviting in their country appeal. The room also incorporates artistic elements, adding to its sense of character, with a range of illustrations adorning the left hand wall and decorative objects scattered throughout to inspire and entertain. This beautifully designed house also incorporates an inviting office space, which delights with its subdued decor, spiced up by the bright colours of decorative objects. The soothing, coffee tones of a comfortable couch relax the space, with an armchair also included to facilitate desk work. Expansive bookshelves house a raft of brightly coloured spines, which invigorate the room alongside the modern, orange lamp waiting to illuminate some quiet reading on the couch. 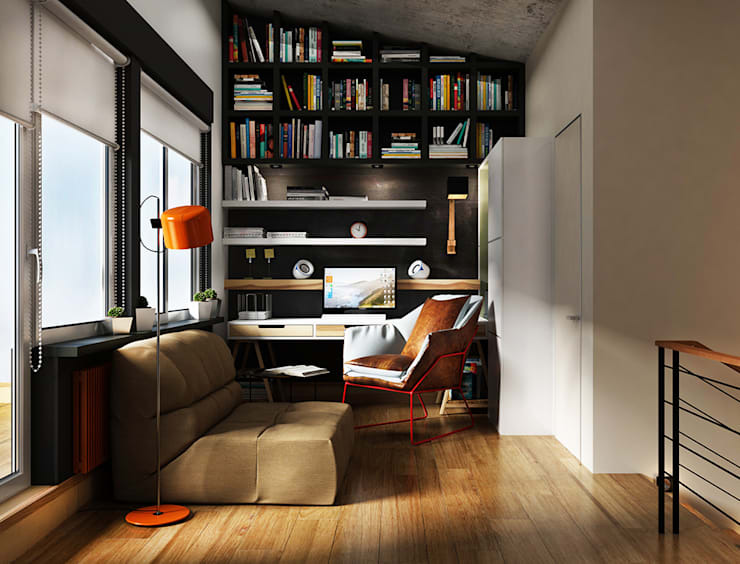 The desk and shelves are contemporary and streamlined, with the entire room presenting the perfect area in which to unwind, read, relax or work in privacy and tranquility. For more ideas about how to set your home apart from the design mainstream have a look at The House of Textures and Tones! Which is your favourite design element within this eclectic home? Tell us below.